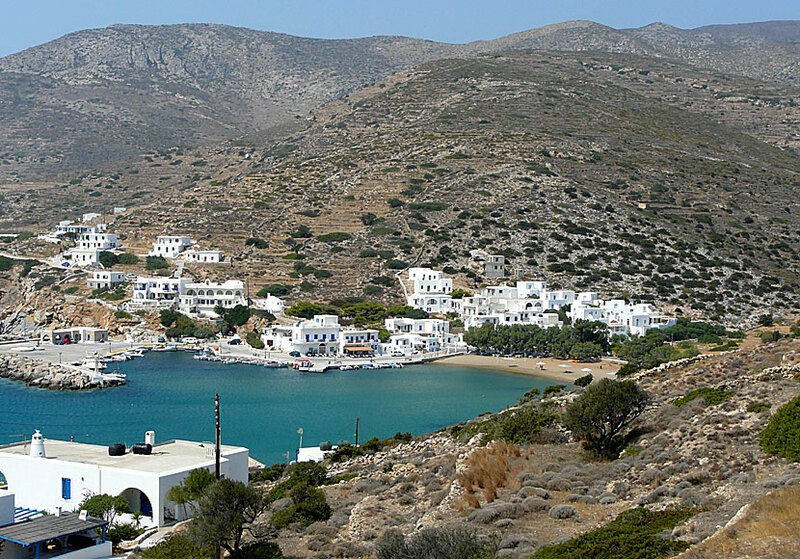 Alopronia port in Sikinos. Beach. Restaurants. Accommodation. 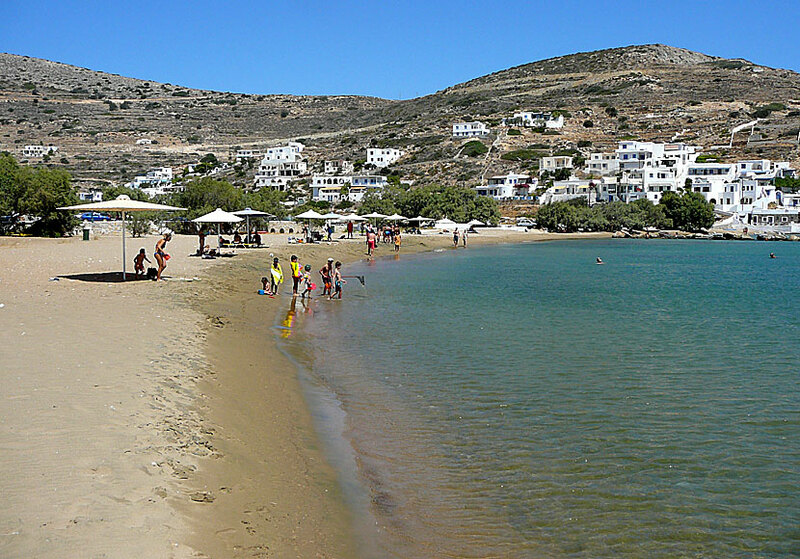 Alopronia, the port of Sikinos, has around 40 inhabitants, but the number is higher during the summer months since the majority of the tourists stays in the port. If we are going to speak about a centre, it is along the waterfront, which starts at the big ferry jetty. 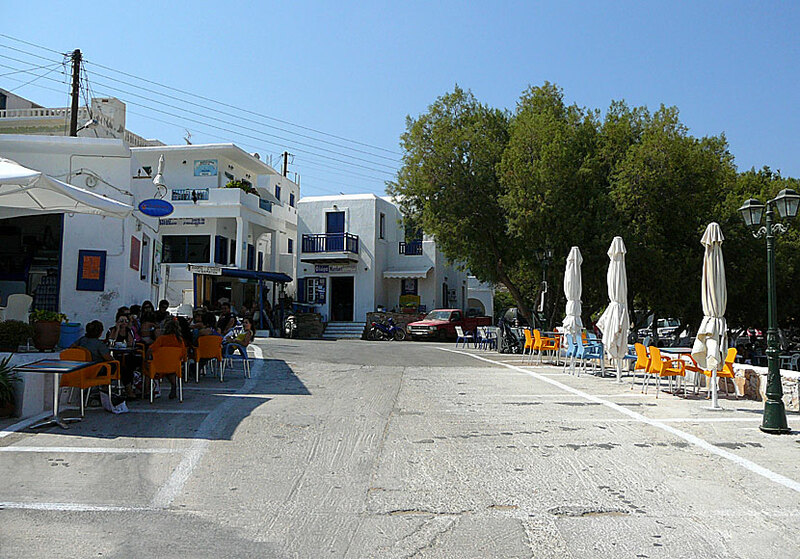 Here are one taverna (Taverna Meltemi), two cafés, one travel agency and one minimarket. There are not much to buy in the small shop, but perfectly enough. There is no bakery, fresh bread are delivered from the bakery in Kastro and can be bought in the minimarket. Where the promenade ends, the port beach starts, which in my opinion is the best beach on the island. The beach is wide and short and consists of sand mixed with pebbles. Free umbrellas are available, but no sun beds. If the umbrellas are occupied, there are tamarisk trees giving shade. On the other side of the beach are many pensions. Behind the pensions starts a teeny narrow path that ends at a pebbly beach. The beach is not much to have, the pebbles are a little too big to lie comfortably on, but they are nice to look at. At the beach there are some abandoned houses that probably were intended for letting at one time. If you like to swim off the rocks you find a place on the right (nose toward the water) of the jetty, just after the Rockcafé. The bus stop lies above the port beach, and a little further on is a highly unusual recycling station for rubbish, something you rarely see in Greece, except that it is unusual this one is really neat. Most of the hotels and pensions lies in Alopronia. If you want to stay near the sea, this is where you should stay.